JTAG/SWD debug probe with USB interface. Based on a 32-bit RISC CPU, it can communicate at high speed with the supported target CPUs. J-Link is used around the world in tens of thousand places for development and production (flash programming) purposes. 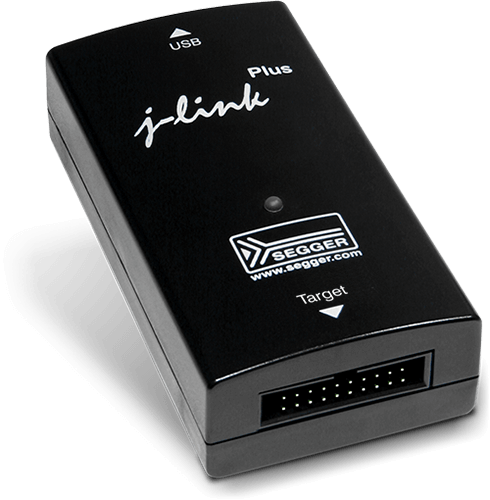 J-Link PLUS is a USB powered JTAG debug probe supporting a large number of CPU cores. Based on a 32-bit RISC CPU, it can communicate at high speed with the supported target CPUs. J-Link is used around the world in tens of thousand places for development and production (flash programming) purposes. J-Link PLUS is available in two form factors with identical function: J-Link PLUS and J-Link PLUS Compact. J-Link is supported by all major IDEs such as IAR EWARM, Keil MDK, Rowley CrossWorks, Atollic TrueSTUDIO, IAR EWRX, Renesas HEW, Renesas e2studio, and many others. Including all models, more than 500,000 J-Links have been shipped so far, making J-Link probably the most popular debug probe for ARM cores and the de-facto standard.